On Wednesday, 24th of January 2018, the cheers of scouts were heard at the anti-drug campus, Dian Nuswantoro University (Udinus). 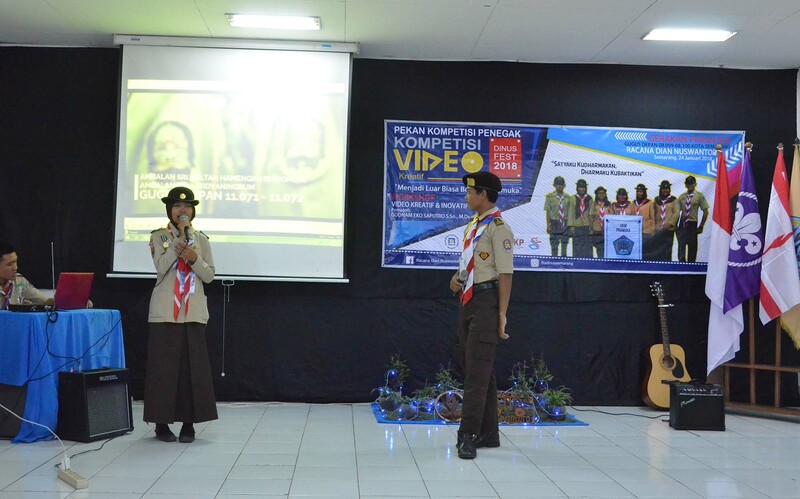 On the second day of Dinusfest, Student Activity Unit of Scout held a creative video competition with theme "Be Extraordinary with Scout". raordinary with scout, so that we can raise any thing in scout that can make its members extraordinary" he explained. The competition was followed by 10 teams which consisted of 5 students each. The participants were come from various schools from Semarang, Demak, Rembang, Salatiga, Kendal, and also Pemalang. In this creative video competition, all participants had to pass two stages, the first was the process of making and editing video, and the second one was participants had to present the video that had been sent before to the three judges. The three judges were Godham Eko Saputoro S.Sn., M.DS, DR Mahmud SE, MM and Thesa Resi Sila Utami M.Sn. The judges are Udinus' lecturers who are qualified in the field. Each team competed for a total prize of 3 million rupiah, tuition and an educational voucher that can be used to study at Udinus. In the soft skill category, Student Activity Unit of Korp Volunteer (KSR) Udinus held a First Aid Competition. Wira’s PMR skills were tested at Dinusfest 2018 located at D building Udinus on the 5th floor with 25 Teams from 16 schools in Central Java. Each Team which consisted of 3 people showed their readiness to provide first aid to victims. The case of the victim determined by the jury and each team’s case was different one another. Jury from Semarang City PMI and PMI of Central Java Province will assess the speed, relief procedure and accuracy of the participants during the competition.